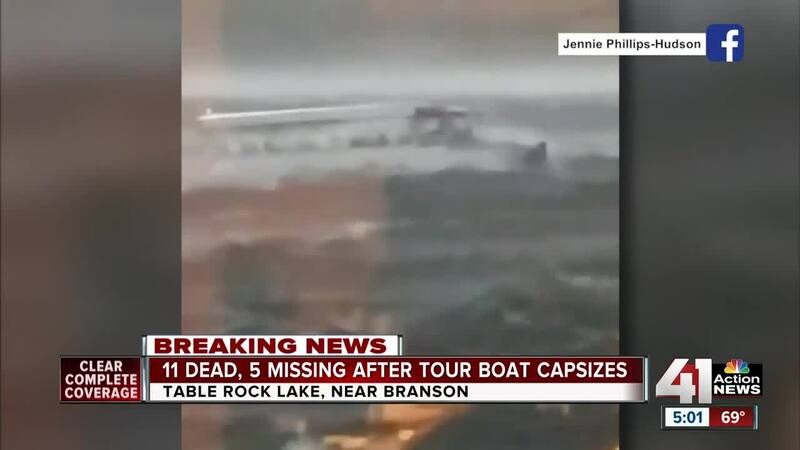 KANSAS CITY, Missouri — The four people still missing overnight after a duck boat capsized during high winds Thursday evening on Table Rock Lake have been found dead. That raises the death toll to 17 people who were aboard a Ride the Ducks boat, which sank as a thunderstorm created dangerous conditions with high waves on the lake and the boat was caught out in the open. Stone County Sheriff Doug Rader confirmed the four additional deaths around 10:30 a.m. Friday after appearing earlier in the day at a press conference with Missouri Gov. Mike Parson. Later in the afternoon Gov. Parson said he spoke to an aunt and 13-year-old boy who lost nine members of their family in the tragedy. Missouri State Highway Patrol divers have located the boat , which is believed to be under 80 feet of water. Rader showed reporters the area where the boat sank. The vessel sank in 40 feet of water, but rolled into deeper water and is on its wheels at the bottom of the lake, according to Rader. The boat will remain underwater until Monday pending investigation. Details about what caused the accident were scant, prompting Rader and Missouri Gov. Mike Parson, who attended a Friday morning press conference, to plead for patience. The investigation by Stone County deputies and the Missouri State Highway Patrol continues, but the Coast Guard and National Transportation Safety Board — entities assisting with the investigation — will determine what caused the incident. Occupational Safety and Health Administration compliance officers also are at the scene conducting an investigation. According to OSHA Spokesman Scott Allen, the company "Ride the Ducks International LLC" has no past history of safety violations. There were 17 people, ranging in age from 1 to 70 years old, confirmed dead late Friday morning. The four people who had still been missing and presumed dead were recovered by mid-morning. Seven people aboard the boat, which had 29 passengers and two crew members when it went down, were injured and seven others were rescued without injury. The captain of the capsized boat survived, according to Rader, but his identity and the identities of the passengers who died have not been released. “Right now, we’re still working with families and making notifications,” Rader said. After the morning press conference, Branson Mayor Karen Best confirmed to 41 Action News that Ride the Ducks Captain Robert Williams , a driver with the lake-tour company, was among the 17 people who died. As the boat went under, a Stone County deputy who was aboard the nearby Showboat Branson Belle, land-based workers for the lake-tour company and passengers who were waiting to board the boat’s next excursion went into the water to attempt and assist in the rescue. There were life jackets in the boat, but it’s unclear how many, if any, passengers were wearing a floatation device, Rader said. “I think it’s going to take some time to answers those questions,” Parson said, urging patience with the investigation to avoid speculation and promised to release a full report in the future. Parson said he hasn’t spoken to President Trump, but said his staff has been in contact with White House staff. Trump has been briefed about the situation and tweeted his condolences Friday morning.